After losing the imperial crown (temporarily) to Bavarian elector Charles Albrecht and seeing the rich province of Silesia wrested from her (permanently) by Frederick II of Prussia in the War of the Austrian Succession (1740-48), Maria Theresa finally succeeded in having her husband, Francis Stephan of Lorraine, formally elected as Emperor Francis I (r. 1745-65). 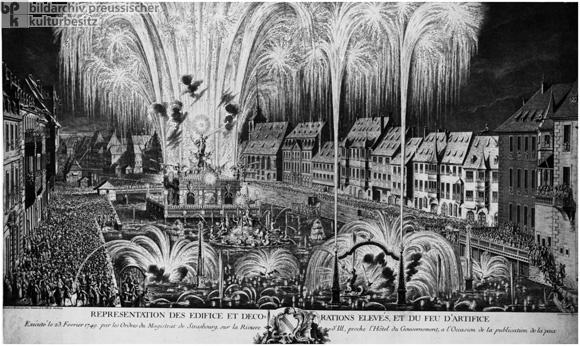 This image depicts fireworks and popular festivities in Strasbourg in celebration of the Peace of Aix-la-Chapelle (Aachen) on October 18, 1748, which confirmed Prussia’s annexation of Silesia and the Pragmatic Sanction. In 1681, Strasbourg had fallen to France, which supported Prussia in the latter part of its war against Austria. This scene is remarkable in that the peace being celebrated was a relative defeat for France, which had failed to advance its policies against the Habsburgs and the Holy Roman Empire. Copperplate engraving by Weis (? ), 1749.